I grew up, photographically, on Bryan Peterson books. “Understanding exposure” and “Understanding shutter speed” were one of the first photography education books (right after “Lightroom”, at that time version 1, by Scott Kelby) that I read after I got my first dSLR. 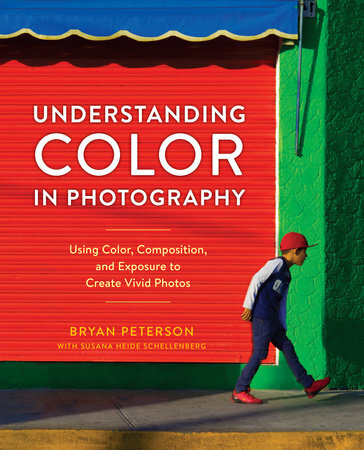 When I saw it for the first time on Amazon, I was really looking forward reading “Understanding color in photography”. Great chefs can’t prepare great meals without cutting, squashing, mixing, steamin, peeling, cutting, simmering, boiling, stirring, and blending the food, and ten arranging it on a plate in a compelling fashion. So, if you want to create truly compelling images, start “cooking”! In “Understanding color in photography”, Bryan Peterson explains how to create compelling images using color. He talks about technique of under (or over-exposing) the image, depending on the main color, to make this particular color pop. He discusses analogues and complementary colors to create strong compositions. The next, largest section of “Understanding color in photography” comprises of what I would call: color monographies. Each section has a brief discussion of the color at hand, including black and white, followed up by what kind of mood the color creates, and then many examples of photographs where the color discussed is the main element. This really is a treat, part of the book that qualifies it for a coffee table section. The larger format and beautifully rendered color pictures are printed on glossy paper. Really, you can just take pure pleasure from browsing through the pages. Since post-processing is becoming the important part of the photography process these days, it is not surprising to see it mentioned in “Understanding color in photography”. However, Photoshop tricks take only a few pages out of 136 of the book, so it clearly is not the main focus. One of the most puzzling things about “Understanding color in photography” is co-author Susana Heide Schellenberg. I do not see her contribution to the book coming through, other than occasional image here and there. I learned few interesting tidbits about of color in photography from “Understanding color in photography”, things I never realized before. For example, do you know if dark color should be on top or on the bottom for a natural look? Do you know if a warm color advances or recedes? Read the book to find the answers, but most importantly, using the knowledge and creative exercise, apply those concepts to take your photography to next level. I have received a free copy of the book for the purpose of this review from Blogging for books. Additionally, the links in this post are affiliate links. See details of our affiliate policy here.